Looking for cat news? Look no more. This page brings you the latest in feline news from around the world, including information about cat health, cat care, cat trivia, and much more. Below you will find several news feeds, which are updated regularly. Plus, you will find interesting stories about cats. Be an informed cat lover! All the feline news you can get... all in one place. Learn about what cats and cat lovers are doing in the world. Please check back often as this news feed is updated regularly. Fellow cat and animal lovers, please support the Fresh Air Fund. Many of us take summer vacations for granted. We go away, maybe to the lake, maybe to the beach, maybe to a resort. But many disadvantaged children don't have that chance. Fortunately, thanks to the Fresh Air Fund programs and generous volunteers, many children from some of the toughest neighborhoods in New York City can experience a bit of summer magic. Help children get a breath of fresh air. Go here to learn more. Cats, a threat to fish? - We all know how kitties love fish. They do eat lots of seafood. But it seems like this love of fish and seafood is a danger to the worldwide fish stock. Fat Kitty - Do you think your cat is fat? Think again. Nicknamed Prince Chunk, this kitty is one of the heaviest felines on record with a weight of 44 lbs. He was found wandering the streets of a South New Jersey town. Later authorities learned that the owner had lost her home to foreclosure. See below for more information. Savannah Cats Banned in Australia - A couple sued the Australian federal government after it banned Savannah cats from the continent. The government argues that this breed poses a threat to endangered species in Australia. Cats May Develop Mental Health Problems as They Grow Older - Experts from the University of Edinburgh, UK, believe that half the cats ages 15 and older suffer from geriatric behavioral problems, such as dementia. 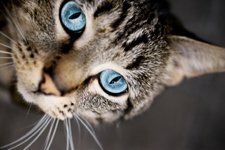 Blog about cats - This blog is full of interesting articles about cats.